In Doncaster Owen works from his home in Tickhill with people who lead a hectic lifestyle and who have built up lots of tension over the weeks and months. He also currently works closely with both professional and amateur athletes. He has worked with Curtis Woodhouse (Professional boxer), Russell Downing and Graham Briggs (Professional Cyclists) as well as members of Team Manvers Triathlon Club and Kimberworth Striders amongst other South Yorkshire Running clubs. The aim is to provide injury prevention through regular maintenance, release muscle tension and restore balance to the musculo-skeletal system. I came to Owen over weight and not too fit (and nearly 50!) 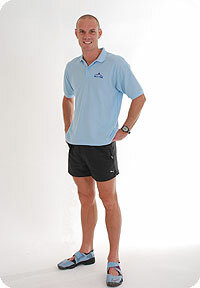 with a goal of doing the London marathon in 6 months; I wanted personal training and sports massage.